Doors open at 5:30 p.m. for refreshments and bingo begins at 7 p.m. Prizes range from $25 to $100 per game. 50-50 raffle during intermission. 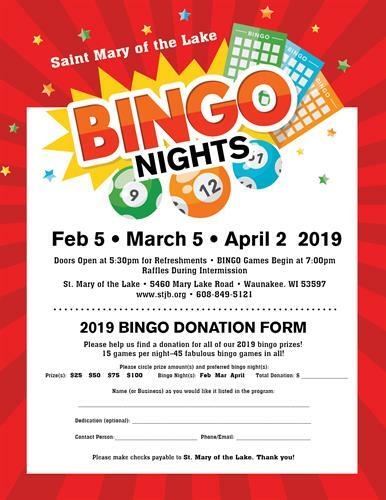 This is the final bingo night of the season! St. Mary of the Lake is located just off of Hwy M, in the town of Westport. 849-5121, ext. 136. For more information, visit www.stjb.org or find them on facebook.